Make sure to read detailed information on the Kalahari Gemsbok. All their special qualities, ways of survival in extreme heat and dry conditions and much more, are described. These mammals are probably, compared to other species, the best adapted to the harsh environment of the Kalahari and Namib deserts in Namibia. See below on the video, in slower motion, how Gemsbok bulls fight. Males have an average shoulder height of 1,2m (47.2") and weight approximately 240kg (530lb). Females are about 1.1m (43.3") at shoulder height with a mass of 210kg (463lb). 264 days (± 9 months). Single calfs are born at any time of the year with birth peaks in the southern Kalahari during August and September. The calf hides and will move with the mother at night to a new resting-place. Calves are usually 3-6 weeks old before they join the herd. Open, arid areas, such as open grassland, Kalahari dune land and bush savanna. The Nr.1 Gemsbok Trophy of Namibia was hunted in the Kalahari in April 2004. It had a total score of 281.7cm (SCI) and was the first to measure 50"! The Roan Antelope, which also has black and white facial markings, but the gemsbok is somewhat smaller, with straight, rapier-like horns. Kalahari Gemsbok Park, Namib Desert, Kalahari region. 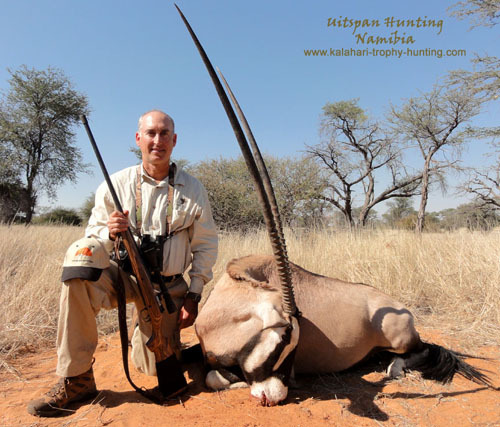 Orlando Rivas, hunter of Uitspan Hunting's record Gemsbok Trophy of 47.5"